Just Host offers a ‘No Questions Asked’. Anytime money back guarantee with all our hosting plans. Yes, Just Host does offer anytime money back. But the ‘anytime’ is just not ‘NOW’. 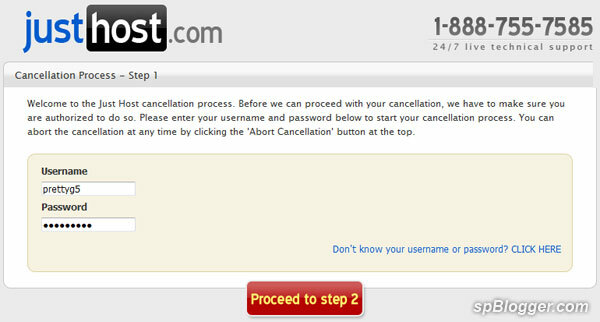 Check out below Just Host cancellation process screenshots to know more about http://cancel.justhost.com. Hahaha… Just Host really knows how to make money online. If I complete this cancellation process, how much refund can I get? NOTHING!!! I informed Just Host cancel team through email that I cannot cancel my account now with this cancellation process website. But they insisted that I need to go though it and then send email to refund team. I did not complete this stupid cancellation process. Just wondering… What will happen if I really did complete it?